Today's Wall Street Journal carried the final "Global View" column written by George Melloan. He is a native of Greenwood, Indiana. Mr. Melloan has written the "Global View" column on the WSJ's Op-Ed page since January of 1990. He has worked for Dow-Jones for the last 54 years. Mr. Melloan touched on his Hoosier roots in his final paragraphs today. Let me thank again those of you who have been generous with your time in sending me your thoughts and criticisms. A tiny few readers have expressed their disagreement in barnyard terms, but, having grown up on an Indiana farm, I long ago became familiar with that kind of discourse. Wall Street Journal writer Alessandra Galloni writes in the April 24, 2006 edition of the newspaper that Spanish toll road and airport giant Abertis Infraestructuras SA is merging with the Italian company Autostrade SpA. The new company will have a market value of over 28 billion dollars. The largest shareholder will be a holding company controlled by Italy's Benetton family, the maker of casual wear and colored sweaters. 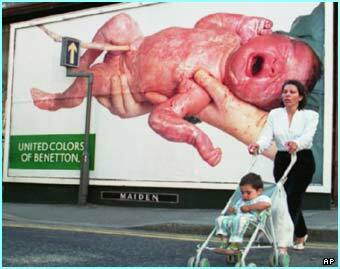 Benetton as an apparel maker has been famous for its shocking ads like the one shown here. The deal will give the combined company more firepower when pitching for concessions to run roads, airports, parking areas, and telecom infrastructure around the world. The industry is considered stable because income from toll roads tends to grow slowly but steadily, with substantial sales and profit growth from obtaining new concessions or installing systems like automated toll collecting. Big-ticket projects like airports rely on government spending and don't shift as quickly along with the rest of the economy. Abertis and Autostrade said the new company plans to spend about 15 billion euros to expand the business across Europe, North America and South America. The New-Sentinel has an online straw poll at which you can cast your vote for the Republican and Democratic nominee for Sheriff, and for your choice in the race for County Commissioner between Bill Brown and Marla Irving. The Indiana Pundit has announced that the online straw poll at its weblog will be closing this weekend. You can still cast an online vote there in the same races highlighted by the News-Sentinel as well as the County Commissioner contest between Linda Bloom and Roy Buskirk and the race for 4th District County Council between Cal Miller and Fred Warner. The poll boxes on Indiana Pundit are located to the right side of the webpage. Berne Native Heads Effort to Curb the "Ugly American"
Keith Reinhard, a Berne (IN) native, is heading an effort to improve the way Americans are perceived in foreign nations. Mr. Reinhard is head of "Business for Diplomatic Action." Mr. Reinhard, a prominent advertising executive who created slogans like "You deserve a break today" and "Two all-beef patties..." said he started looking for ways to polish the image of the U.S. when he heard President Bush express dismay shortly after Sept. 11 that "people did not like us" in other parts of the world. Believing this was potentially a major business issue for U.S. firms selling goods and services abroad, he launched a research effort inside his advertising agency, a unit of Omnicom Group. A polling firm sent questionnaires to people in 130 countries asking how America was viewed and what Americans could do to make a better impression overseas, and task forces from Omnicom studied results and interviewed business executives around the world. Last year, the group distributed guides to college students traveling abroad. This year, the effort has moved to the business traveler. Anti-Americanism is a growing trend that, unless checked, is certain to have wide-ranging and long-term negative effects on U.S. business endeavors, to say nothing of the damage to our reputation as a people, our future economic competitiveness, and the threat to our national security. While it is true that much resentment of our country currently centers on our foreign policy, much does not. Other root causes include the perception that we are arrogant and insensitive as a people, that our culture has become all-pervasive, and that the global business expansion on the part of U.S. companies has been exploitive. At Business for Diplomatic Action, we are committed to the task of mobilizing U.S. corporations to undertake a variety of coordinated public diplomacy actions that will begin to restore America's declining reputation. Advertising magnate Keith Reinhard recalled his Mennonite roots in small-town Berne, Indiana, where he learned lessons that influence his work at the helm of the largest advertising agency in the U.S. He regaled his audience with witty stories and visual examples from the world of marketing, including his own creation of two McDonald's hamburger legends -- "You deserve a break today," and "two all-beef patties, special sauce, lettuce, cheese, pickles, onions on a sesame seed bun." Crossing the border from the Mennonite church to Madison Avenue was not hard, said Reinhard. "I never questioned whether advertising was a suitable calling," he said. "Advertising is about selling, and selling is good. Nothing much happens in the world if nothing is sold." Judge Robert Hines has died in Florida. Judge Hines, who had retired from the Allen Superior Court, lived an admirable life. He had the finest judicial temperment of any jurist I have ever met. He was a kind man and also a courageous one. He was an advocate for the developmentally disabled because he knew of the need from his own family experience. Aside from the editing duties here at Indiana Parley and Fort Wayne Observed, I will sometimes write a comment on another weblog that turns into a post. The editor of the Indiana Pundit weblog has posted some of my ruminations on political yard signs over at that site. You can read what I had to say here at this April 18th post. Note: Once you are at Indiana Pundit you may need to scroll down the page to see my post. The Asher Agency, a Fort Wayne based advertising and public relations firm, is back in the news with reports that Indiana Governor Mitch Daniels and First Lady Cheri Daniels will be appearing in television ads aimed at reducing child abuse. The advertising will be produced by the Asher Agency. The public-service announcements were produced with $250,000 raised from the sale of Kid's First license plates. Agencies for which Asher will be placing media will include the Hoosier Lottery, the Indiana Criminal Justice Institute, the Indiana State Fair, Indiana Tobacco and Cessation, Indiana Department of Revenue, Family and Social Services Administration, Indiana Department of Insurance, and the Indiana Office of Tourism Development, among others. Working with each state agency, Asher will plan and execute media buys that will include broadcast and cable television, radio, outdoor and print advertising. Asher’s contract with the state will begin August 8, 2005 and run through August 7, 2006, with an option for a one-year renewal. Founder Tim Borne was a Democratic candidate for state representative in 1968 and a 1972 candidate for state senator against Phil Gutman. The agency received substantial State of Indiana business after Evan Bayh became Governor in 1989. Much of that advertising spending was related to Indiana tourism and then new Indiana State Lottery. The agency has handled political accounts for both Democratic and Republican candidates. Two area Republican candidates whose advertising campaigns have been managed by Asher are Allen County Commissioner Marla Irving and Fort Wayne City Council member John Crawford. Commissioner Irving's campaign finance report filed Monday showed that she had spent $25,794 with the Asher Agency so far this year. The Allen County Right to Life Political Action Committee has sent out a fund-raising appeal. The letter doesn't seek donations to be given to an Allen County candidate. The letter seeks funds to support the opponent of Indiana Senate President Pro Tem Robert Garton of Columbus. The letter urges its Allen County recipients to back candidate Greg Walker in the state senate Republican primary election. "In June of 2004 our letter to you said that "Our objective has to be to elect a majority of pro-life Republicans to the State House and to elect a pro-life Governor. Only then will we begin to put a stop to the taking of innocent lives in the abortion clinics and the anti-life decisions in the courts and other state offices." Little did we expect our cause would lose in the Senate. Yet Senator Garton, widely considered to be the most powerful state Senate leader in the nation, did not get this pro-life legislation passed. There is a way to hold Senator Garton responsible. He is being opposed in the May 2 primary election by a strong pro-life candidate, Greg Walker. Aaron Baker is a Van Wert County (OH), native who attends college in Marion, Indiana, at Indiana Wesleyan. Mr. Baker also writes a weblog. He got some excellent news recently. He let his weblog readers know this week that he got a coveted Washington, D.C., internship this summer in the office of U.S. Represenative Mike Pence. I've an internship! I got the magic call this morning that I have an internship with U.S. Rep. Mike Pence. It's the start of the baseball season. Tuesday, the Arizon Diamondback's General Manager Bob Melvin was asked by a reporter for MLB.com about his most memorable opening day moment. He replied that it involved Vice-President Dan Quayle throwing out the first pitch. "I caught [then vice president] Dan Quayle's first pitch in Baltimore, and he wanted me to get down, and I wouldn't do it," Melvin said. "I didn't want to embarrass myself and not catch it, so there was a little bit of an issue there that stalled things for a bit." In case you're wondering the pitch was slightly off to the right. 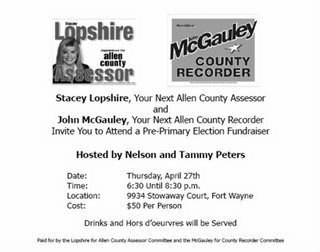 John McGauley and Stacey Lopshire have announced they will be holding a joint fundraiser on April 27th at the home of Allen County Commissioner F. Nelson Peters. Mr. McGauley is a candidate for the Republican nomination for Allen County Recorder. Ms. Lopshire is a candidate for Allen County Assessor. This wouldn't be so unusual except that Ms. Lopshire is the niece of Herb Summers, the only candidate running for the Democratic nomination for Allen County Recorder. Mr. Summers is the son - and Ms. Lopshire is the granddaughter - of the late Walter Summers, who held several elective offices including State Representative and Allen County Assessor. A Democratic leaning website, "Down with Tyranny," has analyzed the Congressional races in Indiana. The writer has a hope that perhaps Indiana could turn its delegation from "red" to "blue." The writer had an interesting take on the 3rd District which seemed to have as much to say about the Democratic front-runner, Tom Hayhurst, as it did about incumbent Mark Souder. The races in the other districts would need a major Democratic tsunami for any changes from red to blue. CD 3 in the northeast of the state (from Goshen to Fort Wayne) is represented by Mark Souder, another entrenched rubber-stamper (though not as far off the cliff of insanity as Sodrel or Pence-- but almost). There appear to be 4 Democrats vying for the opportunity to challenge him: Kevin Boyd, a progressive pastor who looks GREAT on the issues, Tom Hayhurst, whose slick website smells DCCC all the way (no positions on issues), and 2 guys with no websites Thomas Schrader and Edward Smith. Bridget Bobel On NBC'S "Deal or No Deal"
The April 12th broadcast of NBC's game show "Deal or No Deal" featured 25 Miss USA 2006 contestants and Miss USA 2005 Chelsea Cooley. Miss Indiana, Bridget Bobel, a Peru native, was among the 25 Miss USA contestants holding briefcases on the stage of the "Deal or No Deal" set. "Deal or No Deal" features Howie Mandel as host. The other Miss USA contestants selected were: Haleigh Stidham(AL), Kimberly Forsyth AR),Tamiko Nash (CA), Ashlee Greenwell(DE), Cristin Duren(FL), Catherine Warren(IL), Tara Conner(KY), Christina Cuenca(LA), Katee Stearns (ME), Tiffany Kelly (MA), Danelle Gay(MI), Kristi Capel (MO), Lauren Scyphers (NV), Jessica Boyington (NJ), Onawa Lacy (NM),Samantha Holvey(NC), Kimberly Krueger (ND), Allison Machado(OR), Tanya Lehman(PA), Leeann Tingley (RI), Lacie Lybrand (SC), Soben Huon (UT), Amber Copley (VA), Jessica Wedge (WV). Bridget Bobel is representing Indiana in the MISS USA pageant. Miss Bobel, a Peru native, is a former staffer for the Majority Caucus in the Indiana House of Representatives. She is now in Baltimore where the pageant finals will take place April 21st. A Baltimore television station reported on a trip the MISS USA contestants took to the Baltimore-Washington International Thurgood Marshall Airport (BWI) to cheer departing members of the U.S. armed forces. The televised story can be seen here. Miss Bobel handles herself very well during her brief time on camera. The television segment, though, is a bit over the top. I was struck by the length of this local television news segment and the enthusiasm of the reporter. It is not something seen in most Indiana television markets. "We just really appreciate our troops going over and serving our country," said Miss Indiana Bridget Bobel. "They're fighting for our freedom and the freedom of so many other people," she added. The Washington Times reports comments by soon to be ex-U.S. Representative Tom DeLay as to who may be worthy to succeed him in his role as leader of House conservatives. Indiana's Mike Pence is one of the three. Asked who might be the House's "next Tom DeLay," the former majority leader, once considered the most powerful Republican in Congress, named three Republicans: Rep. Adam H. Putnam of Florida, Rep. Mike Pence of Indiana and Rep. Patrick T. McHenry of North Carolina. When told of Mr. DeLay's remarks, Mr. Pence said simply, "I accept the compliment." Mr. McHenry said, "I'm blown away ... I'm so excited that Tom DeLay would say that about me." Overlooked by Mr. DeLay were more than 100 other conservative-voting House Republicans, some of whom are known beyond their home districts and even their states. Mr. McHenry is the youngest member of the U.S. House of Representatives. The Miami Herald's Sarah Rothschild wrote about how tough it can be to be covering the racing beat. Covering Paul Dana's death last week seemed surreal. As I immersed myself in writing several articles for Monday's paper, I barely had time to digest that he died during a pre-race crash. I had met Paul for the first time on March 2. The rookie reporter and the rookie race car driver. We chatted for a few minutes as he walked to a photo shoot. The topic: Northwestern University, where we both received journalism degrees. We bonded over our similar backgrounds and he told me how he started as an auto racing writer as the first step to pursuing his driving career. I presumed the coming months would allow me to develop a stronger rapport with him.